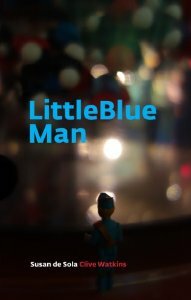 Although it isn’t made clear in this long poem, interspersed with photographs of a small blue Thunderbirds figurine in various tableaux, the little blue man is probably Alan Tracy, judging by his bright, auric hair. Putting Alan Tracy in a series of often incongruous settings brings to my mind Pittenweem artist Reinhard Behren’s ‘Naboland’ project, where he sets a small, battered toy submarine into all of his paintings. This pamphlet carries as an epigraph the zeugma of George Bernard Shaw: “We don’t stop playing because we grow old; we grow old because we stop playing.” On the surface, it seems as if this poem will serve as a picaresque for Alan Tracy’s adventures in the world, following the traditional anthropomorphic pattern of toys in imaginative literature, but it quickly becomes apparent that Clive Watkins’s notion of play is quite different. the voluptuous gravity of its almost intangible dark? It would be unfair to say this pamphlet is the product purely of play, of poet and photographer having a bit of fun and encouraging the reader to join in. It seems to be doing something more complex and nuanced than this. The ‘quest’ the poet speaks about in the closing lines suggests that the whole project has been an enquiry into creativity and artistic collaboration and how poetry, notoriously thought of as being concerned with itself and its own abstractions, is coming out of itself to comment on the process of the photographer and how they stage their scenes, and so the pamphlet unfolds on multiple levels of like-minded creative processes. a single pure note witnessed, though silent. in a tangle of masonry and falling girders. the monotony of obedience and order. This leads into the final stanza where a friend’s father, who served in the armed forces, would produce a tuning fork of unspecified pitch and let it sound before sitting down at a piano to play a sonata (presumably pitch and note perfect). or soft, but dense as a blood-red shield. proud to have a piece of his great friend’s art. It still hangs there now. The thick red paint and leafless tree suggests the painter’s mood. The implication is that the painting is not likeable. It’s the act of loyalty in displaying the picture that is important. The last line is given poignancy because readers already know the father has passed on, survived by PJ. However, I found the poem’s rhythm prosaic and couldn’t see that setting it out in couplets added anything that wasn’t achieved in writing it as two paragraphs of a prose poem. understanding of our chosen craft. There’s a tenderness here and a reaching out to try and find common ground, despite mutual bafflement at one another’s chosen craft. 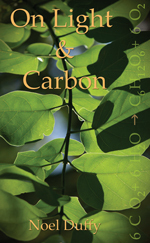 ‘On Light and Carbon’ is a collection of quiet, considered poems which explore both personal and scientific themes and which are very similar in tone and rhythm.